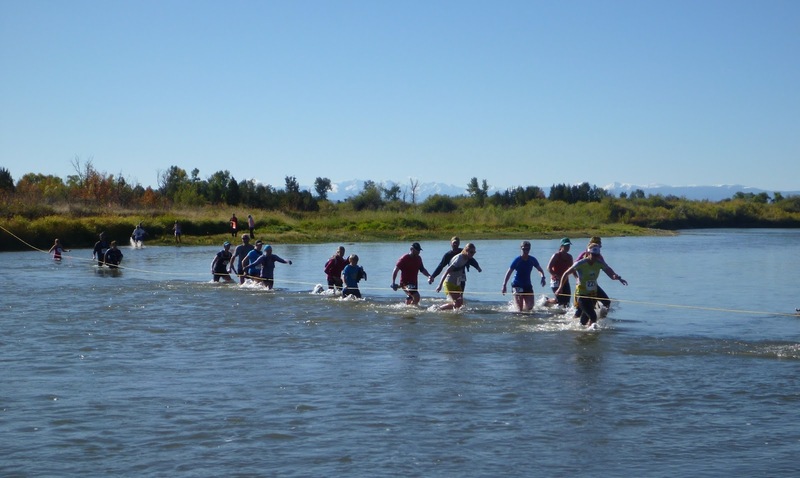 The John Colter Run is one of Montana's most iconic races due to its longevity and notorious (but fun!) mid-race river crossings. We are excited to have the John Colter run as part of the Treasure State Trail Series this year, and as part of the series we asked Race Director Kurt Buchl about the race. How did you become involved in the John Colter Run? The race had run consecutively for 35 years then 6 years ago when the race sponsor at that time was setting the course they ran into a Safety Engineer from Montana Rail Link. Once they found out the course crossed the tracks twice, first at a designated crossing but the second just over the regular tracks in the middle of nowhere (sketchy at best remembering 150 runners had to beat or wait for a train) they canceled the race due to safety issues. 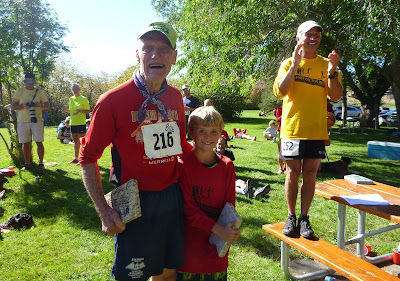 As I loved this race and one of my favorite I started working on the course to determine if there was a safe route to take the race and found a railroad trestle going over a spring creek which we now go under. Several meetings later with Montana Rail Link, their safety engineers and a chance beer around the fire pit and the Colter is now back in business. The John Colter Run has one of the greatest origin stories out there. 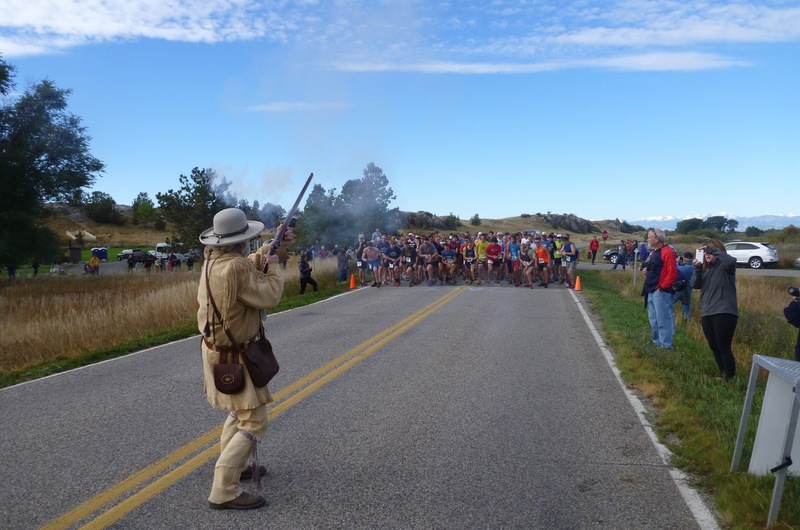 Can you give a brief description of the original John Colter Run? In 1806, John Colter bid farewell to the Lewis and Clark Expedition to pursue a living trapping furs and guiding in the wilderness of the Rocky Mountains. During the fall of 1808, Colter and his partner, John Potts, were trapping along the Jefferson River when a group of hundreds of Blackfeet warriors appeared on the bank. They killed Potts and took Colter prisoner. The Blackfeet stripped Colter naked and gave him a 300 yard running head start. The entire war party gave chase across the cactus covered plain toward the Madison River. After a few miles, Colter had outdistanced all but one of the warriors who let fly with a shortspear. Colter dodge the lance, retrieved it, and killed the warrior. This bought Colter enough time to make it to the Madison River where he hid under a pile of driftwood while the Blackfeet warriors hunted up and down the river bank. Sometime after dark, Colter slipped down river and began his journey toward safety. Eleven days later, exhausted, cold, and naked, Colter limped into Fort Lisa on the Big Horn River, 250 miles away. What can runners expect to find out there on the course? This is a closed course which is only opened up on race day so the runners will see and find the hills and course just as Lewis and Clark would have on their journey through the area and as John Colter would have on that eventful day in 1808. We keep the course as pristine as possible using rock cairns to mark the way. Of course the highlights of the course is the start which is done by an official “Mountain Man dressed in period gear starting the run with a flint lock rifle, chasing down our own John Colter, several “Burma shave” type fun signs on course that denote key cool areas, a 12 foot tepee with a live band for the aid station followed by 2 river crossings towards the end. At the end we have another live Blue Grass band, full organic BBQ with all the fixings and all you can eat and drink which is free for everyone, spectators and runners alike. There is so much more that you really have to run the course to drink it all in! From John Colter to the Bridger Ridge Run the Big Sky Wind Drinkers put on some of the more iconic races in the state. What are the Wind Drinkers? 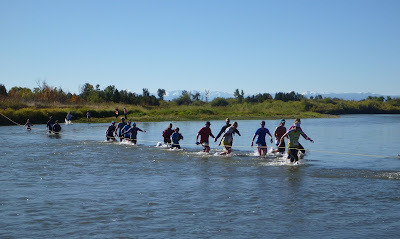 The Big Sky Wind Drinkers is a local running club for all ages and abilities. The club motto really says it all. "It is not important how fast one runs but that one runs." The club puts on a series of fun runs on Wednesday nights over the course of the summer which are free to all with snacks and fellowship at the end. There have been some incredible athletes to run the John Colter Run. What does the field look like this year? Who should we keep an eye on? There is a power house of runners every year, but with the varied trail conditions from the 1st 1.5 miles of flat road transitioning into the rugged single track trail really levels the playing field for all. We will again host a full field of incredible athletes and recommend watching the whole pack as everyone will bring something to the race. Thank you Kurt! For more information on the John Colter Run be sure to visit winddrinkers.org. The John Colter Run is this weekend, September 16th, but is currently full. If you are looking for another Treasure State Trail Series race for this weekend be sure to check out the Nitty Gritty 1/2 in Red Lodge.